After searching all over Etsy, I found yet another nice little shop that makes crocheted accessories. You all know how I mentioned that I love to dress up my baby girl. 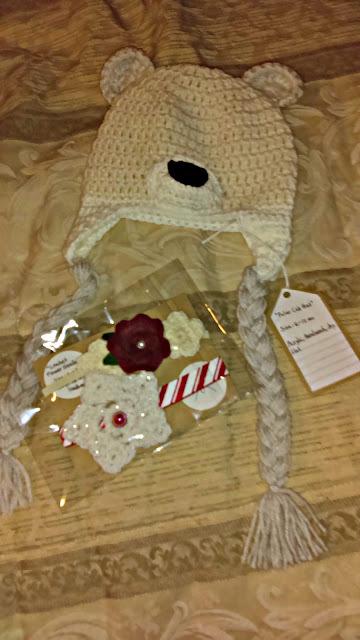 Look at what I received from Mini-Mae Crochet. Her goal is to make simple and cute products that let the uniqueness of your little one shine. All items are designed and handmade by me. Please know that unless your item to Ready to Ship, it will take time to crochet. This time varies by season. This is the Rudolph the Red Nosed Reindeer Headband. It is made with candy cane striped elastic and a white sparkle crocheted star with a tiny red bead in the middle. I love this, especially for the upcoming Christmas holiday. It would be really nice paired with a pretty Christmas dress or other holiday outfit. This is the Polar Cub hat. It's made from thick, high quality acrylic yarn. It's made from a few different colors to distinguish the nose from the face, to the ears. I love how the designer blended the colors together. This hat is perfect for keeping your baby's head warm in the fall and winter time. I love how it fits and how it looks on my daughter. This little gem is the Christmas Baby Flower Headband. Pretty, right? It has a gorgeous little felt cranberry flower, embellished with leaves and a tiny pearl in the middle, as well as surrounded by white crochet flowers. The band is elastic. It's light around my baby's head and not uncomfortable. She didn't mind it on her head one bit and it looks really nice. It can be worn with something dressy or casual. It's a nice accessory to add a little jazz to any outfit your baby is wearing for the holidays. I love all three items that I received. My daughter now has some very nice additions for her Thanksgiving, Christmas, and New Year's outfits, and even to wear just because. Visit her shop to see all three of these beauties, as well as everything else she has to offer. Come in different sizes and custom ordering available.